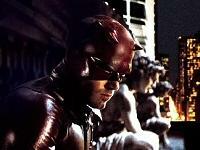 When it was first released in 2003, ‘Daredevil’ received a massive amount of critical flack and fan backlash. Too shiny! Too flashy! It’s got a case of the Afflecks! Granted, it had the misfortune of following ‘Changing Lanes’ and ‘Pearl Harbor,’ as well as being released in the same year as ‘Gigli’ and ‘Paycheck’ (none of which were as outright awful as people accused them of being), but naysayers had a field day raking the otherwise average superhero yarn over the proverbial coals. Yet, five years later, the tar-and-feathered film still manages to sell, has earned multiple releases, and continues to attract followers with a longer, and ultimately more satisfying, Director’s Cut. When attorney Matt Murdock (Ben Affleck) was a boy, an accidental encounter with radioactive material blinded him, but radically heightened his other senses. Murdock can tell if someone’s lying by listening to their heartbeat, “see” his surroundings using echolocational hearing, and “read” the raised ink on a newspaper with his fingertips. He uses his abilities to defend innocent clients by day and vault around the city by night as a masked vigilante. 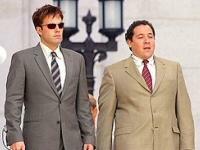 As he spends his evenings dispensing justice to the denizens of Hell’s Kitchen, he works to avoid a clever reporter named Ben Urich (Joe Pantoliano), earn the affections of a mysterious young woman named Elektra (Jennifer Garner), and protects loved ones like his best friend and legal partner Foggy (Jon Favreau). 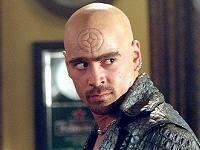 However, when the man responsible for his father’s death, a criminal dubbed The Kingpin (Michael Clark Duncan), hires an assassin named Bullseye (Colin Farrell) to kill the hero, Murdock decides it’s time to take the fight to his enemy’s doorstep. Let me begin by recommending that anyone who shrugged off or absolutely hated the 103-minute theatrical cut of ‘Daredevil’ give the 124-minute Director’s Cut a legitimate shot. I have to say, it offers a surprisingly different experience. I’m not suggesting the new version fixes all of the film’s problems, but it does deliver a more cohesive and intriguing interpretation of the Marvel Comics mainstay than theater goers experienced in 2003. We get to spend more time with Murdock in his day to day life as a lawyer, we see more of his personal interactions with staff and friends, and we get more time to examine his quest to subdue the criminal element of Hell’s Kitchen. Plus, Affleck and Farrell -- the real adversaries and central performers in the film -- do a fine job with what they’ve been given. Script issues abound, but the actors work overtime to craft well-developed, compelling characters who elevate the screenplay and production. The biggest issue I still have with ‘Daredevil’ is that it changes so much about the characters and their relationships. I’m certainly not about to go on a fanboy tirade (I know cinematic adaptations require a healthy amount of change), but director Mark Steven Johnson (‘Simon Birch,’ ‘Ghost Rider’) and producer Avi Arad seem to have altered a lot of fundamentals that should have remained untouched. Add to that a dense, overplotted screenplay -- penned by the director himself -- that relies on convenient encounters, loose logic, and seemingly random exposition. Most troubling, however, is a clumsily edited, anti-climactic showdown between The Kingpin and Daredevil. It not only fails to provide a satisfying conclusion to the story, it doesn’t really resolve any of the pre-established conflicts. The Kingpin should have been the definitive baddie in Hornhead’s universe but, as it is, Bullseye is a far more dangerous villain. The film tends to evaporate the moment he and Murdock have danced their dance. This Director’s Cut makes ’Daredevil’ a far better film than the one fans had to endure in theaters. It never quite overcomes its weak screenplay and hyperactive, overproduced cinematography, but it still has more than a few intense sequences, witty character exchanges, and decent doses of superhero action to keep things interesting. ‘Daredevil’ may not be the best comic adaptation to come along in the last five years, but it definitely isn’t the worst. ’Daredevil’ features a garish but accurate 1080p/AVC-encoded transfer that faithfully reproduces the stark contrast and intricate fine details of the film. While the palette is often submerged in shadow and Affleck’s suit rarely reads red, colors are vibrant and bold. Many of the daytime sequences look utterly striking with warm, natural skintones and flawless blacks. Likewise, nighttime shots suffer from poor delineation, but remain clean and deep. Detail pops as well, rendering gorgeous textures and crisp edges without relying on any artificial nonsense like edge enhancement. To top it all off, I didn't detect any distracting artifacting, banding, or image-smearing DNR. Unfortunately, there are a few minor problems. Black crush is an intermittent distraction, long shots lack the discriminating clarity of close-ups, and film grain spikes rather dramatically at times. Still, all of these issues can either be attributed to directorial intention or the original print. As it stands, the Blu-ray edition of ‘Daredevil’ puts the standard DVD to shame, offers fans the best conceivable presentation of the film, and represents an impressive effort from Fox. As if a sharp and faithful transfer wasn’t enough, Fox ups the ante by pairing ’Daredevil’ with a forceful DTS HD Master Audio 5.1 lossless surround track that, quite literally, steals the show. Dialogue is crisp, well balanced throughout the soundfield, and nicely prioritized in the mix, even amidst the busiest action sequences. Better still, LFE support is aggressive and persistent, rear channel presence is full and convincing, and it was a cinch to immerse myself into the complex soundscapes of Hell’s Kitchen. I was also pleased with the track’s abundant ambience and precise directionality -- both of which contribute to an incredibly involving experience. In fact, some of the busier scenes in the film could easily be used to demo high-end sound systems. It’s that good. If I have any nitpick, it’s that the sound effects are occasionally so punchy and over-the-top that they tend to dominate scenes that could offer more realistic environmental acoustics. An early bar fight is a whirlwind of convincing sonics, but a third act showdown in a cathedral is less defined than I would have liked. Whether it’s the result of a minor prioritization mishap or simply a matter of intention is to be seen (or heard, as it were). 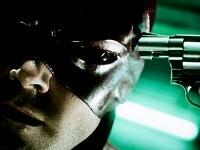 All in all, ‘Daredevil’ sounds fantastic and will excite anyone looking for an audible dose of superheroics. 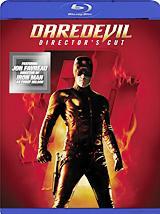 The Blu-ray edition of ‘Daredevil: Director’s Cut’ features more than six hours of supplemental material that appeared on the original DVD and eventual Director’s Cut DVD releases. Sure, the video content is presented in standard definition and there aren’t any BD exclusives to be found, but the wealth of information more than makes up for it. Personally, I’m ecstatic to see Fox is finally giving fans every feature that’s available instead of trimming away excess content like they did with BD releases such as ‘I, Robot.’ The only thing that would have made this package more enticing for completists is if the studio had included the theatrical cut of the film as well. Audio Commentary -- Writer/director Mark Steven Johnson and producer and former Marvel Studios honcho Avi Arad sit down for an unexpectedly engaging chat about the genesis of the project, the shoot, and key changes made to the original characters. More importantly, the two reveal the behind-the-scenes drama that forced them to drastically alter the film, the differences between the theatrical and director’s cuts, and their opinions on what works and what doesn’t. Regardless of how you feel about the movie or Johnson’s treatment of the Daredevil mythos, this is an excellent commentary. Behind Hell’s Kitchen (SD, 59 minutes) -- This extensive documentary offers countless interviews with cast, crew, and production team members, behind-the-scenes footage of the shoot, fight choreography, and stuntwork, and a look at the costumes, set design, and special effects that brought Matt Murdock’s world to life. Behind Hell’s Kitchen Enhanced Viewing Mode -- Like the standard DVD, the Blu-ray edition includes an interactive feature that allows you to access bits and portions of the larger documentary as the film plays. This isn’t an exclusive PiP track, but it's a decent addition to the package nonetheless. The Men Without Fear (SD, 59 minutes) -- Likewise, this equally thorough documentary details the origins of Daredevil, the character’s comic book appearances and evolution, and dozens of interviews with comic industry writers and artists. Production Featurettes (SD, 51 minutes) -- A collection of production featurettes delve further into the film. “From the Comic to the Big Screen” is an HBO First Look EPK hosted by Jennifer Garner, “Giving the Devil His Due” explores the editing process, “Moving Through Space” introduces consultant Tom Sullivan and his contributions to the film, and a series of six “Multi-Angle Dailies” looks at the creative process. Performance Featurettes (SD, 5 minutes) -- We also get a collection of bland “Jennifer Garner Screen Tests” as well as a “Kingpin” short that features a very personable Michael Clark Duncan. Fact and Fiction Trivia Track -- A text based trivia track that can be accessed during the film’s playback. Trailers (SD, 6 minutes) – Rounding out the package are three theatrical previews of the film. The Director’s Cut of ‘Daredevil’ is a completely different experience from the original theatrical version, making this one worth a watch… even for those who didn’t enjoy the flick the first time around. This new cut doesn’t eliminate every issue I already had, but it does offer a more cohesive and compelling vision of the character and adaptation of the mythos. Opinions of the film aside, this disc is an excellent effort from Fox. It features an excellent video transfer, a powerful lossless audio track, and a vast collection of supplemental material. I hesitate to recommend the release based on the merits of the film itself, but the disc is simply too strong to warrant anything less.